This volume presents a practical demonstration of the relevance of Carl Schmitt's thought to parapolitical studies, arguing that his constitutional theory is the one best suited to investing the ’deep state’ with intellectual and doctrinal coherence. 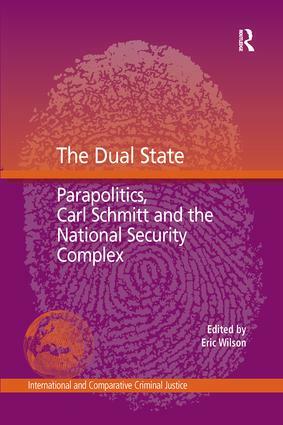 Critiquing Schmitt’s work from a variety of intellectual perspectives, the chapters discuss current parapolitical reality within the domain of criminology, the parapolitical nature of both the dual state and the national security state corporate complex. Using the USA as a prime example of the world’s current dual or ’deep political state’, the criminogenic dimensions of the parapolitical systems of post 9/11 America are discussed. Using case studies, the dual state is examined as the causal factor of inexplicable parapolitical events within both the developed and developing world, including Sweden, Canada, Italy, Turkey, and Africa. Contents: The concept of the parapolitical, Eric Wilson; State-corporate globalization and the rise and demise of the new deal world order, Tom Reifer; Capitalism, covert action and state terrorism: toward a political economy of the dual state, Nafeez Mossadeq Ahmed; ’America is addicted to oil’: US secret warfare and dwindling oil reserves in the context of peak oil and 9/11, Daniele Ganser; Researching parapolitics: replication, qualitative research, and social science methodology, David N. Gibbs; The unusual suspects: Africa, parapolitics, and the national security state complex, Enrico Carisch; State hierarchy and governance: of shadows or equivalence in regulating global crisis, Mark Findlay; Dual state: the case of Sweden, Ola Tunander; Canadian stalking horse: ’a parallel power’, David MacGregor; A study in gray: the Affaire Moro and notes for a re-interpretation of the Cold War and the nature of terrorism, Guido Giacomo Preparata; Schmitt, Ergenekon and the neocons, Len Bracken; The spectacle and the partisan, Jeff Kinkle; Targeting journalists and media in the new world order, Stig A. Nohrstedt and Rune Ottosen; Afterword: dual Schmitt, deep Schmitt, William A. Rasch; Index. Eric Wilson is senior lecturer of public international law at Monash University, Melbourne, Australia. He is editor of Government of the Shadows: Parapolitics and Criminal Sovereignty (Pluto Press, 2009). He is also the author of The Savage Republic: De Indis of Hugo Grotius, Republicanism, and Dutch Hegemony in the Early Modern World-System (c.1600-1619) (Marinus Nijhoff Press, 2008). His primary research interests are the philosophy and history of public international law, critical jurisprudence, and critical criminology. This series explores the new and rapidly developing field of international and comparative criminal justice and engages with its most important emerging themes and debates. It focuses on three interrelated aspects of scholarship which go to the root of understanding the nature and significance of international criminal justice in the broader context of globalization and global governance. These include: the theoretical and methodological problems posed by the development of international and comparative criminal justice; comparative contextual analysis; the reciprocal relationship between comparative and international criminal justice and contributions which endeavor to build understandings of global justice on foundations of comparative contextual analysis.